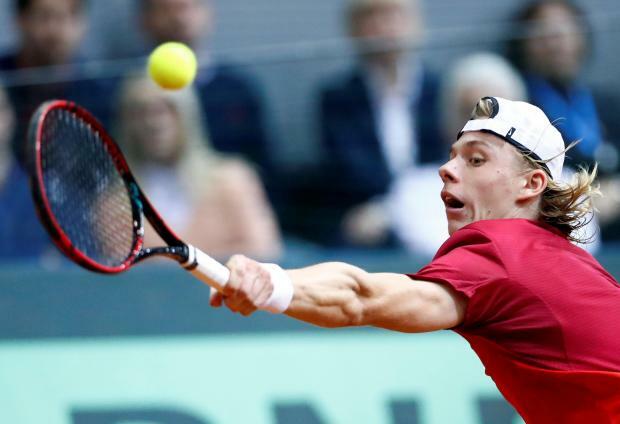 Denis Shapovalov of Canada in action during his match against Borna Coric of Croatia. The Davis Cup is set to be transformed into an 18-nation World Cup-style tournament under new proposals put forward by the International Tennis Federation. It is hoped the new event, named the World Cup of Tennis Finals, would feature the game's leading international stars and be played in one location over seven days at the end of each season. It would involve a round-robin stage with the top eight teams moving forward to knock-out rounds. The proposal has been unanimously endorsed by the ITF board of directors and will be submitted for approval at the annual general meeting in Orlando, Florida in August. The ITF has announced a 25-year partnership, worth three billion US dollars, with investment group Kosmos to fund the tournament. The federation says "several world-class cities" have already expressed interest in hosting the event. ITF president David Haggerty said: "This is a complete game-changer for the ITF and for tennis. Our vision is to create a major season-ending finale that will be a festival of tennis and entertainment, featuring the world's greatest players representing their nations to decide the Davis Cup champions. "This new partnership will not only create a true World Cup of Tennis, but will also unlock record levels of new investment for future generations of tennis players and fans around the world." Matches would consist of two singles rubbers and one doubles, over best-of-three sets. The event will also feature a play-off round which will allow eight nations to qualify for the following year's finals, while the current zone group competition will continue underneath that. Barcelona and Spain footballer Gerard Pique, the founder and president of Kosmos, said: "Kosmos is thrilled to join in this exciting partnership with the ITF. Together we can elevate Davis Cup to new heights by putting on a must-see World Cup of Tennis Finals featuring the top nations and top players." Great Britain captain Leon Smith vowed to keep an open mind on the proposal until it received final approval. "There's still a long way to go as it requires a two-thirds majority approval at the ITF annual general meeting in August, but we're still passionate about Davis Cup and I, like everyone else, realise that changes need to be made to ensure longevity and status of the competition," Smith said. "Of course one of the first things that came to mind is the loss of the home and away tie. It works in other sports but remains to be seen if it could work in Davis Cup, however, I do think it's really positive that the ITF are looking at significant investment from other sources to secure the future of the competition. "For now we'll just have to keep an open mind as we start to learn more about this proposed new structure and, whatever the outcome, I hope the Davis Cup remains the most important team event in world tennis."